For some reason, I can’t help but feel a sense of gloom at Christmas. As you get older, what was a magical time, is now a sobering if not sullen time. But things have changed. Remember when outdoor Christmas lights could survive a Cat 5 hurricane, when everyone had a manager scene outside their place, when Christmas pageants were bigger than Tom Cruise? Then it was easy to pull off a decent “holiday” season. Families were nuclear–not nuked. It didn’t require a cruise ship or something akin to war planning to get everyone together for the holidays. 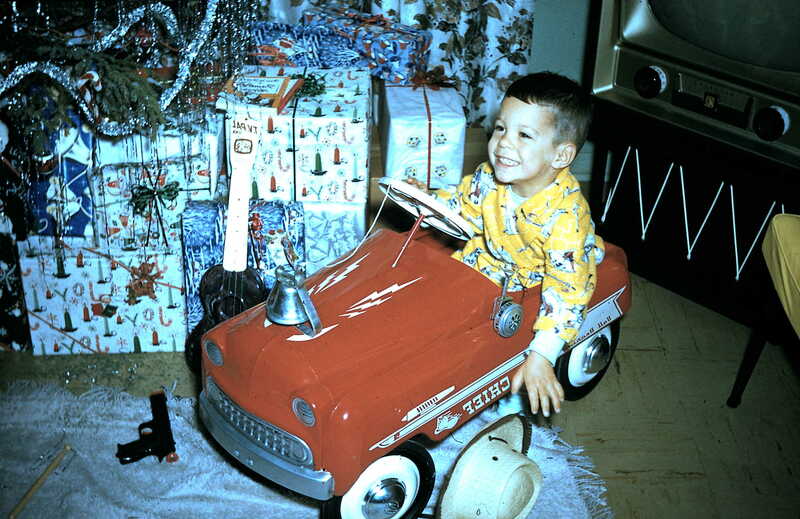 Back then you’d wake up to blinding movie lights with nervous gleeful anticipation of toy trucks, cap guns, drum sets and Tinker Toys. Now, the family meanders to the tree, all on their iPhones, to collect a stack of gift cards. I remember piling into the cavernous back seat of our 1958 Chevy and crossing town to my cousin’s. I’d envy what he got and he’d ogle my stuff. Then we’d sit around a big table with dusty centerpiece for dry turkey and watch adults try not to yell at each other like they normally did. Sooner or later everyone ended up in easy chairs listening to my uncle spin tales, except for the moms, who took four hours to clean up the kitchen. All along Bing Crosby would be singing Silver Bells in the background on a scratchy record player. Those were the days. Yes, there are the realities of advancing age, the knowledge of eventual sickness and death, awareness of things spiraling out of control in the world, the frailty of any financial security we might have these days. But hey, what does Christmas signal? The Wonderful Counselor, Mighty God, Eternal Father, Prince of Peace is on the ground! While a return to the fifties is only possible in a DeLorean, there exists a constant transcending source of Yule Tide cheer. I think it’s why they started this Christmas stuff in the first place. If it can be so in “the lands of Zebulun and Naphtali” in Bible times, why not now? For me? No time is happier than a harvest reaped or victory won. You get to enjoy the produce of the fields, or the spoils of conquest. Far more the gladness produced by the presence of the Lord! When Jesus first arrived more than 2000 years ago, it was to a limited number. Now we sense his presence inside, and His Spirit produces gladness in spite of conditions that might otherwise produce doom and gloom. In the future, for all believers, there will be constant and certain gladness. We will be in His presence. The original Christmas gift was The Child humbly born. This same child would ultimately bear the full weight of the government of all mankind, fueled oddly by his peace. In a future day, people “will study war no more.” Justice and righteousness will reign. His zeal will accomplish this. Oh, that we might manifest this same zeal as we await his second incarnation, just as certain as Isaiah foretold his first. There should be a great burden lifted from our backs as followers of the risen King. The yoke should be loosened. The grating rod on our shoulders lifted. The boot on our throats released. All that represents doom and gloom was gone the instant Jesus breathed his last. All the doom and gloom was transferred to his shoulders in death, but in three days he rose and a new light dawned. Nothing should rob us of our gladness at Christmas–or at any other time. Are we expressing a gladness that wells up from within despite our circumstances? That compelling joy (mentioned more than twenty-four times in Isaiah) will turn the hearts of the people, because they will see the authenticity of Christ in us (his presence), just as the first disciples did in him. God with us then and now! This entry was posted in Commentary, Devotionals and tagged Christmas, Eternal Father, gladness, gloom, Isaiah 9:1-7, Jesus, Matthew 4:12-17, Mighty God, Prince of Peace, Wonderful Counselor. Bookmark the permalink.